Beautiful layout. I am in the process of catching up with my albums. Most difficult thing is choosing papers, colors and embellishments, don't you think? Cannot wait to see tutorials on the Silhouette - especially since I spent way too much time extracting letters from the Cricut mat that still don't look great. Grrr. You make it seem so easy. Love the crochet flowers. Hugs to yourmom for making them. Tfs! Fabulous layout! Love the doily (I have one of those dies but have been afraid to use it! lol!!!) 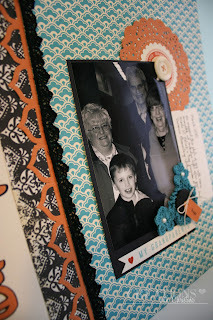 You are inspiring me to get back into a little more scrapbooking! And I love, love, love the little flowers your mom made and what a great addition to your layout! Very special. The LO is lovely... It turned out beautiful. I would have problems putting those 2 pp together. Great video Christina and the LO is just gorgeous. Ooh Christina what a BEAUTIFUL layout! I love the paper, the lacey borders and the crochet flowers are perfect on this layout! What a keepsake! TFS! Lovely scrapbook page. The color were wonderful. Thanks for the video also. Wonderful scrapbook page. I love the picture and all the elements you used. Just beautiful. Really beautiful Layout Christina.. love your tutorials.. I just don't know how you do it. All those colors maatch perfectly and look awesome together. What a beautiful layout. Beautiful layout Christina! Thank you so much for sharing. Love all the pieces you blend together so nicely. Love the Layout!!! Great ideas. This video seemed so professional. I visit your blog everyday. Thanks so much for sharing. I hope your summer is great! I am enjoying your videos on 12 x 12 layouts as that is what I do most. Wow such a fabulous page! Great layout love the colors and the added details. Very nice. Your mom did awesome on the crochet flowers. Does she have a pattern to share for us that would love to make some???? I would love to get the pattern if at all possible. Thanks for much for sharing more layouts lately. I love card making, but really want to expand into scrapbooking more and videos like yours really help. Yes, I did enjoy your video. Great layout and I'm happy that you are doing more of them. They are wonderful and give me great inspiration. Thanks! I love the colors on your layout. My mom also does the crochet flowers for me :) Miss all the layout video's, which is my favorite thing in scrapbooking.Btw I love my Silhouette but still learning. So pretty!!! thanks for doing more scrapbook layouts. I enjoy cards but... scrapbooking is my passion. I would love to know what pattern Mom Horn used for the flowers, I have being tring to fing one for a long time and can not find one like. Those look like just the right size. love your layout, and special meaning it has for you. I love that ur making scrapbookpages:) Really inspiring! I`m so curious on what font u`ve used? I can`t seem to get a good look at it, but it looks like a font I`d looove :) Could u help ?